Coffee took root in Costa Rica near the end of the 1700s. The Arabica coffee plant was first grown in Costa Rica’s Central Valley, where ideal growing conditions – including fertile soil, high altitude, and a cool climate – contributed to its success. Cultivation continued and the Costa Rican government soon realized the enormous economic potential of coffee. To encourage production, the government offered free land to coffee farmers in the 19th century. During this time, production skyrocketed. By 1829, the revenue from coffee exports surpassed tobacco, sugar, and cacao. Coffee was initially exported to Panama and then to Chile, where it was rebranded under the name “Café Chileno de Valparaíso” and sent to England. In the mid-1800s, English captain William Le Lacheur Lyon sent hundreds of bags of Costa Rican coffee to Britain. It fell into the right hands and sparked a national interest in Costa Rican coffee. Indeed, until World War II England was the largest recipient of Costa Rican coffee exports. The coffee industry created a wealthy upper class of growers and traders. 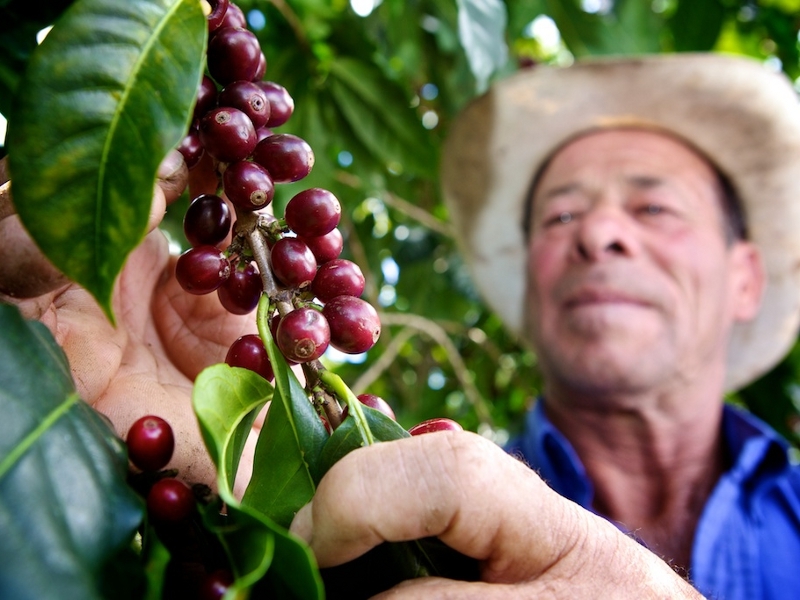 Many had ties with government officials and helped secure the role of coffee in the Costa Rican economy. Although the balance of power during this time was unequal, the revenue from coffee did contribute to the modernization of Costa Rica. It helped build a railroad to the country’s Atlantic coast and construct the National Theatre in San José. Nowadays, Costa Rican coffee is prized as some of the world’s best and is shipped everywhere from Austin to Amsterdam.Small farmers play a large role in this production—nearly 90 percent of all producers cultivate less than 12 acres (5 ha). Fair trade coffee is becoming increasingly popular throughout the world. That makes a big difference in places like Costa Rica, which has over 70,000 farmers growing coffee. According to globalexchange.org, around 45,000 of these farmers belong to cooperatives that may be involved with fair trade organizations. Fair trade organizations like Fairtrade International and the Rain Forest Alliance work to secure better rights and salaries for small farmers. Fair trade certification promotes environmental, social and economic sustainability, and often emphasizes shade-grown and organic coffee. Farms that are inspected by Fair Trade labelling organisations must comply with environmental, health and safety regulations. Cooperatives bring together small farmers to help secure better bargaining prices for their products. There are cooperatives in Santa Elena, Buenavista, Sarapiquí, Tilarán, Montes de Oro, Pilangosta, Llano Bonito, and Coopeldos. Some cooperatives are also part of a secondary cooperative that works on larger scales to improve the standards of living, rainforest reforestation, crop diversification, women’s development, and educational programs in the communities of coffee farmers. While traveling through Costa Rica, you’ll likely see coffee fields spreading out in green-and-brown mosaics across the hillsides. It’s an attractive, pastoral sight. Most of the country’s coffee is grown in the San José, Alajuela, Puntarenas, Heredia, and Cartago provinces. These provinces have climates that are perfect for growing coffee. In such places, the soil is volcanic, slightly acidic and extremely fertile. The higher elevations – particularly between 3,900 and 5,600 ft. (1,200 and 1,700 m) – have cooler climates that are nicely suited to the needs of coffee plants. The most classic Costa Rican coffees are mild and softly acidic. They are good afternoon pick-me-ups and pair well with deserts. Growers are currently experimenting with new flavors that are brighter and fruitier. These are less traditional than older varieties, but may find an audience in the international market. Touring a coffee plantation is a great way to learn about the history and production of this important plant. As you walk through the fields, guides will explain how coffee is grown and harvested. You’ll learn about the de-pulping, drying, and roasting process, and will often be given a fresh cup of coffee at the end. It’s a fun and informative experience.